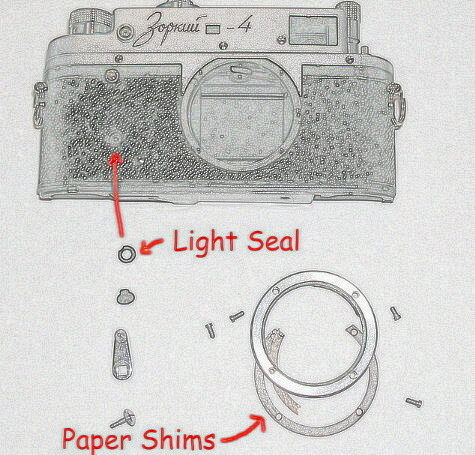 Sorry if this is a slow load: the FED 3 and Zorki 4 are so similar that I decided to bunch them together, so I think there are a total of about 8 pages of sketches on this link. NOTE: If you need information on a FED 1 or a Zorki 1, CLICK HERE. NOTE: If you need information on a FED 5, CLICK HERE. 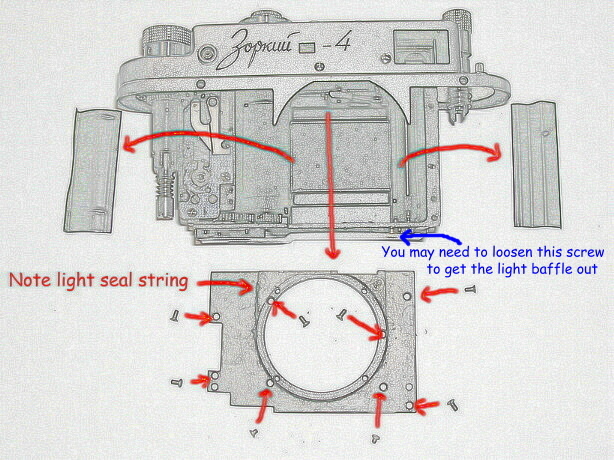 For a discussion of how the later FED/Zorki shutter works, CLICK HERE. NOTE: The Zorki 4K is just like the 4, except for its lever-advance feature. 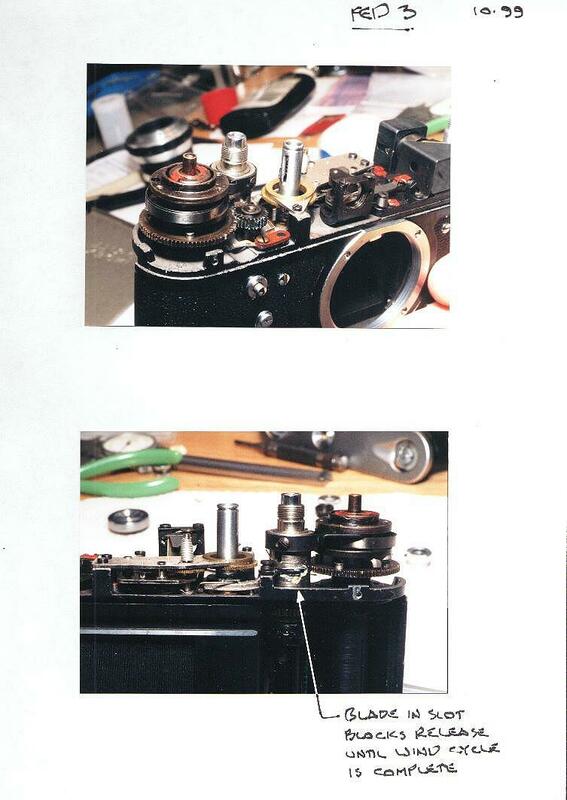 Click here for notes on Disassembling the 4K wind lever. Thanks to JW de Leeuw in the Netherlands for these notes! First remove the lens mount and the self timer lever. Watch for the shims under the lens mount, and make sure you put it back on the same way up. All screws are normal RH thread. 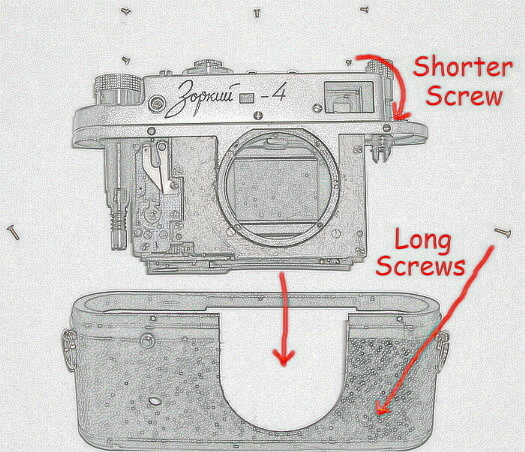 *NOTE: In some Zorki 4's, the screw in the self timer lever has a LH thread. My notes are based on a 63xxx serial number example, which has RH threads throughout. 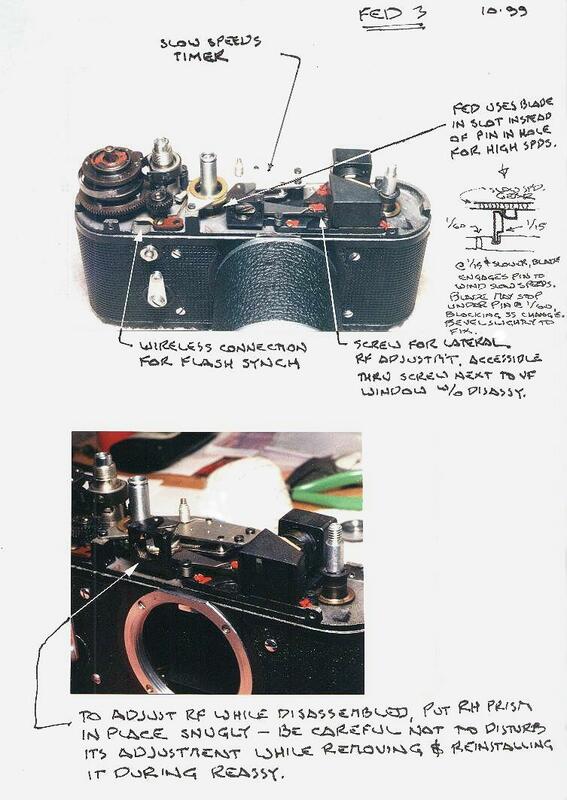 I have had a report of a 73xxx camera with a LH thread on the self timer. Next, remove all of the chrome screws around the edge of the top cover (2 in front, 3 in back) and the 2 additional ones on the front. Now you can pull the outer shell downward and off of the camera. Under the body shell is another front cover plate. Remove all the screws from it and it too will slide off downward (poke the RF follower in to let it slide past). Under it are two light baffles that cover the shutter curtains. 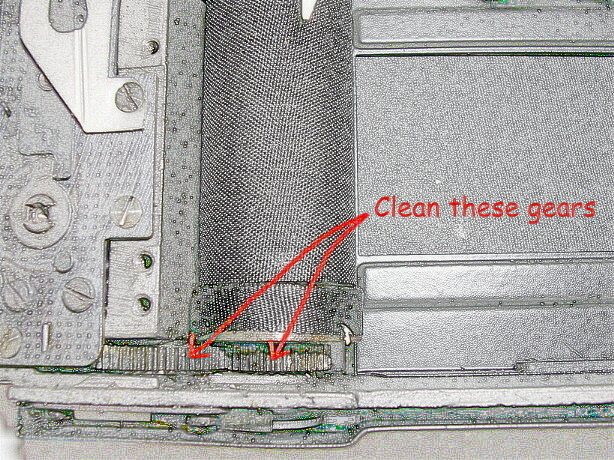 You may need to loosen a screw in the bottom to clear one of the baffles to get it out. Now you're in!